Here’s one we’ve all encountered – bananas ripening before our very eyes. Right? Don’t you hate it when that happens? Yes and no. Yes because no one enjoys fending off microscopic fruit bugs doing the nasty with this yellow Parthenocarpic. No because that means Banana Bread is en route. Did you know that Bananas are technically berries? So, yeah, I love it when bananas ripen at the speed of light because that’s when I get to make Banana Walnut Bread. I prefer chopped Walnuts in mine but really, you can incorporate just about any nut lying around in the kitchen. Husbands and children exempted, ‘kay? Preheat the oven to 350 degrees F. We’re using the centre rack. Grease the loaf pans generously with non salted butter and set them aside. In the bowl of your mixer, combine mushed-up bananas with sugar, oil, eggs and vanilla. Mix well on Medium speed. It might look as though the ingredients have separated but they haven’t. Add flour mixture and mix on Low until completely blended. At this point, the mixture will resemble batter (insert sigh of relief, like I did). Stir in the nuts. Divide batter equally into the loaf pans. Bake for 35 to 45 minutes until a toothpick inserted into the centre comes out clean and dry. Should the tops of the loaves darken before they’re baked through, remove from the oven, cover with foil and return them to the oven for the remaining duration of the bake time. 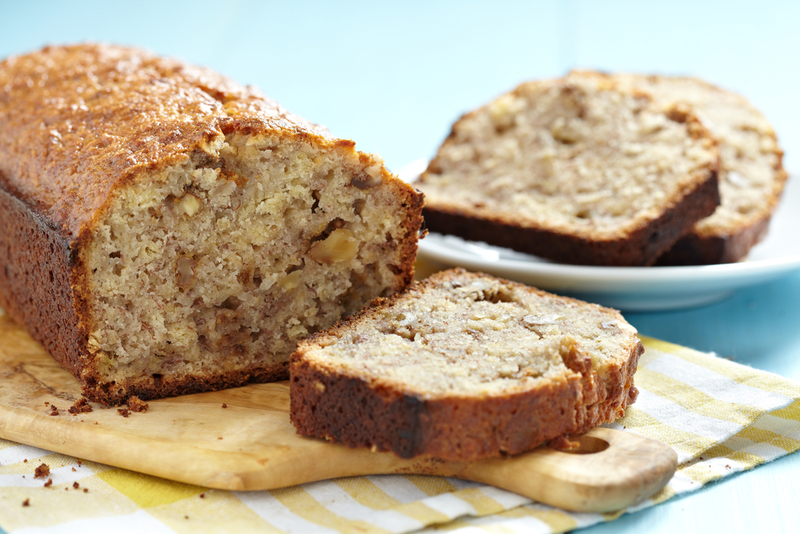 Let the Banana Walnut Bread Loaves stand for 10 minutes prior to serving. I like wolfing mine down with a tisane. If you want a slightly different flavour profile, you can add lemon or orange zest (or several tablespoons of the juice) into the batter. My daughter often begs me to include Dark Choc Chips so there’s another version right there. Adapted from the amazing Browneyed Baker.